So, you’ve decided you want to do it. 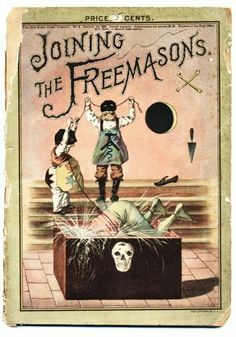 You wanna bite the bullet and join the Masons, OES, the Shrine, DeMolay or otherwise. What do you actually need to do to accomplish this goal? These next few weeks I will be touching on how to join a Masonic organization, and a brief overview of what happens when you first join. The first step is to find what’s out there. If you live in a large city, you may have many different Lodges or Chapters in the area. (There’s around 12 here in Omaha.) If you are in a less populated area, you may only have one to choose from. If you are lucky enough to have options, use that to your advantage. Every Lodge feels differently, they attract different kinds of members, and have different kinds of focuses, such as ritual work, or fellowship. If you are able to shop around, do it, and join the Lodge or Chapter that “feels” right to you.Just because you meet with members from a Lodge does not mean you are tied to them. You have no obligation to a Lodge or Chapter until your initiation, and even then, if you move, or change your mind, its just a few forms to put in to transfer. If you find that there is only one group in your area, rock it. Work with what you’ve got. If you just feel like you just can’t make it work, look into surrounding areas. Many people choose to drive an hour or more for the right Lodge or Chapter. If you are having issues finding a Lodge or Chapter in your area, you will want to contact your jurisdiction’s Grand Lodge. The best way to decide if a Lodge or Chapter is right for you, is to go as a visitor to some of their events. This means dinners, fundraisers, outings, and any other activity that they may put on that does not take place in the Lodge room. Get to know some of the members, connect with people. You may find that the majority of members are far older than you are. This is pretty much the norm across the board as far as Masonry and its affiliate groups are concerned. Don’t let this discourage you. Yes, it may mean you can’t bond over technology or video games, but the older generation are wonderful for life advice. For instance, T and I are getting married in October, and my chapter has given me some priceless advice not only for getting married, but also married life. I guess what I’m trying to say here is don’t write people off just because they are much older than you are. You probably have more in common than you think. Alright, so you’ve found the Lodge or Chapter for you, and you’ve talked with some of the members, and you think it should be a good fit. The next step is to ask for a petition. This is basically just a form that has all of your contact information on it, as well as a few questions about yourself. You can see a example Masonic petition here. A lot of it is pretty standard stuff, think of it kind of like a job application. Mostly they are looking for the fact that you are who you say you are. Always answer as truthfully as possible. If you look at the petition, question 30 is one of constant debate. This will be worded differently in every jurisdiction (and really the way this one is worded is a little harsh, but hey, it’s Texas). Basically they are looking for the answer that you believe in some kind of higher power. As you can imagine, this tends to be a hot topic, but that is for another day. At this point we will leave it at that every potential Mason (as well as many affiliate groups) require a belief in a higher power. Please note: Some jurisdictions will ask if you were born male. If you identify as male, and you have a M marker on your drivers license, this is good enough for most states, but don’t be surprised if they outright ask you. This is also a topic for another day. Don’t worry too much about finding Mason’s that you know to sign it, this is why you go and have dinner with them a few times. What’s more, many members will jump at the chance to be what we call “first line signer”s. With your petition filled out and turned in, you play the waiting game. Your petition will be read at the next business meeting, whenever that should be. Hopefully your contact (the person who gave you the petition) will let you know. Technically the entire petition is to be read during the meeting, but this is not usually the case due to time constraints. After reading the petition, a committee is formed, with the purpose of interviewing you. Regardless of what a petition says, a committee is always formed. The interview is often a nerve racking event for many people, although it really shouldn’t be. Someone from the Lodge or Chapter will arrange to meet with you, either in your home, or at another location (mine was at the Shrine, I know that others have had theirs at coffee shops). Again, they are just looking to make sure that you are who you say you are. It’s really all very informal. They will ask you about your job, your relationships, your hobbies..you get the idea. It kind of feels a bit like you are filling out a very odd dating profile. You will want to dress at least business casual for this meeting, your contact will tell you if you need to wear more than that. Once the interview is over, the committee goes back to the members, and give a brief description of what you are like, and if they would recommend you to become a member. Remember: very rarely is someone turned down for membership. Usually if they are, it is for a major reason, such as identity theft, background issues that you lied about (felonies, etc), or simply not meeting the requirements of membership. The vote for membership for must be unanimous. Masonic groups use a small box that contain white balls (or cubes) and black balls. A white cube is a yes vote, a black ball is a no. And yes, this is where the term “blackballed’ comes from. If for any reason, a member recieves a black ball, they are barred from petitioning to any Lodge or Chapter for six months. When that six months are up, they may attempt again, but it must be at the same Lodge or Chapter. How I was notified of my acceptance. Yes, it was typed on a typewriter. Once you are voted on and accepted, you will be notified, usually by mail. Your initiation date is set, and you wait some more. Please know that this system of petitioning can take a very long time, especially if a Lodge or Chapter only meets once a month. 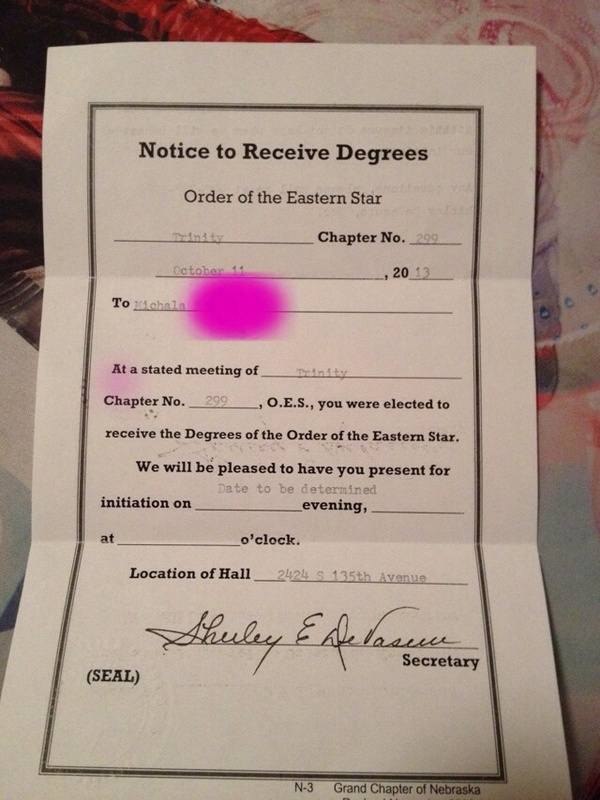 When I petitioned to join OES, it was about 4 months from when I got my petition until I was initiated. It’s not a fast moving process, so don’t get too frustrated. Next week, we will take a look at what happens during an initiation. Until then, have a great week!